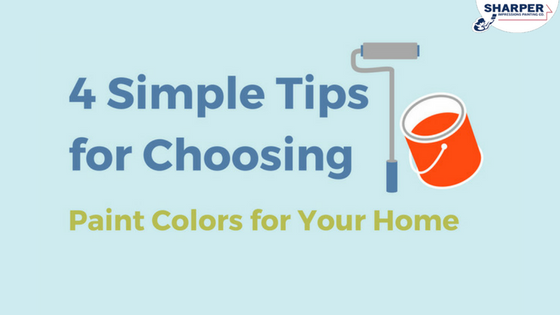 Choosing the right paint color for your home can be a difficult task. With the wide variety of paint colors out there, how can you possibly choose? One of the many upsides to working with professional house painters is the free paint color selection services that come with your paint project contract. So, if you’re wondering how to pick the perfect paint colors for your interior or exterior walls, the following free services can help you narrow down your choices. Get Free Paint Testers at Your Local Paint Store. Head to a nearby paint store with your signed contract and they will provide you with two color try-on cans of paint along with foam brushes. You can even have the paint colors delivered right to your door! This will allow you to test out the color on your walls before making a commitment. Tape Color Swatches to Your Walls. A professional painting company can mail large swatches to your home so you can tape them to your walls. This will help you quickly and easily see how each color will look on your siding or home interior. Schedule a Free In-Home Paint Color Consultation. When you hire professional house painters, you will have the chance to schedule a free color consultation with an expert paint color consultant. They will come directly to your home and give professional advice to help you make a more informed decision. Have Your Walls Digitally Painted. You can also opt to get a free digital, printable image of your home that includes your desired paint color choices. Simply take a picture of your home, email your painting company the image and your color choices, and in about a week you will receive a photoshopped picture of what your house will look like with the new colors. Choosing the right paint colors can completely transform the look and feel of your home. If you need help deciding on the perfect color scheme, our team at Sharper Impressions Painting offers expert in-home color consultations, large paint swatches, paint testers, and photoshopped images of your home — all free of charge with your signed contract. You can also request a free house painting quote. Let us help you transform your home into a space that you love to live in!